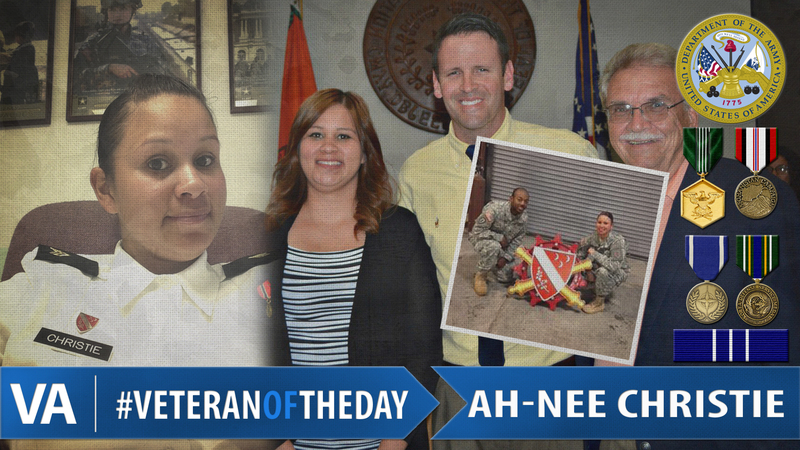 Today’s #VeteranOfTheDay is Army Veteran Ah-nee Christie. Ah-nee served during Operation Enduring Freedom. Ah-nee served for seven years as a field artillery firefinder radar operator. She deployed to Afghanistan in support of Operation Enduring Freedom from March 2012 to March 2013. While in Afghanistan she served as the first female member of her unit and the first female artilleryman in the 1st Battalion, 15th Field Artillery Regiment. For her service, she was awarded the Afghanistan Campaign Medal with two campaign stars, the Army Commendation Medal, the Department of State Meritorious Honor Award, the North Atlantic Treaty Organization Medal and the Korean Defense Service Medal. Currently, Ah-nee is a full-time student at Northeastern State University. She has a one year old son and pug named Alan. In her spare time, she is actively involved with Native American community events and the stomp dance community. Thank you for your service, Ah-nee! If you put someone up here there must be a good reason and I look at more of them as time goes on. This one is particularly good – Army Veteran Ah-nee Christie – and Native American. Great stuff!